Babylon, NY General contractor Stalco Construction, Keller Sandgren Architects, structural and mechanical/electrical/plumbing/low voltage engineer The LiRo Group, and the New York State Metropolitan Transportation Authority (MTA) have completed the construction of the Long Island Rail Road’s (LIRR) new, 3,000 s/f Wyandanch Train Station. LIRR is one of the busiest commuter train systems in the country. Ridership on the Ronkonkoma Branch, of which Wyandanch is a part, has doubled over the past 25 years, necessitating the new passenger station as well as track upgrades. The Wyandanch Train Station services 4,000 passengers daily. The new station is part of two initiatives: Wyandanch Rising, a program that aims at improving the hamlet of Wyandanch; and the Double Track Project, which added a second track to the LIRR’s Ronkonkoma Branch, increasing service reliability for those living and commuting along this corridor. The development of the new station building was initiated by the Town of Babylon, which incorporates the hamlet of Wyandanch, as part of Wyandanch Rising. The program began in 2002 as a $500 million public-private downtown redevelopment effort to develop a 40-acre zone in the areas north and south of the Wyandanch LIRR tracks into a walkable, family-friendly community. It was, in part, a reaction to the Suffolk County Planning Commission’s having named Wyandanch the most economically distressed community on Long Island just two years prior. Wyandanch, an unincorporated hamlet of 11,000 within the Town of Babylon, was suffering from poverty and skyrocketing crime rates. So far, the revitalization has included the construction of new apartment buildings, retail, an ice-skating rink, a spray park, a botanical garden, a 920-space LIRR parking garage for commuters, and, among other items, the construction of a sorely needed key sewer line. Stalco has served as general contractor on other projects as part of Wyandanch Rising, including the above-mentioned 14,400-square foot, $10 million Geiger Lake Memorial Park Spray Playground and Pavilion. This facility, the largest municipal water park on Long Island, features a spray playground with over two dozen play elements, including play bridges, water cannons, and an Adirondack-style pavilion. In addition to the structural design work as well as mechanical, electrical, plumbing, and fire-protection systems engineering for the new Wyandanch Train Station, The LiRo Group also provided construction inspection services for the LIRR’s Double Track construction. In addition to Keller Sandgren Architects, the architectural team in the preliminary design phase also included Torti Gallas + Partners (hired by the Town of Babylon to work on the schematic design), and Merrill, Pastor & Colgan Architects (master planner for Wyandanch Rising, which worked on the initial design). Once the general look and feel of the station was defined, Keller Sandgren took over as the main architect. 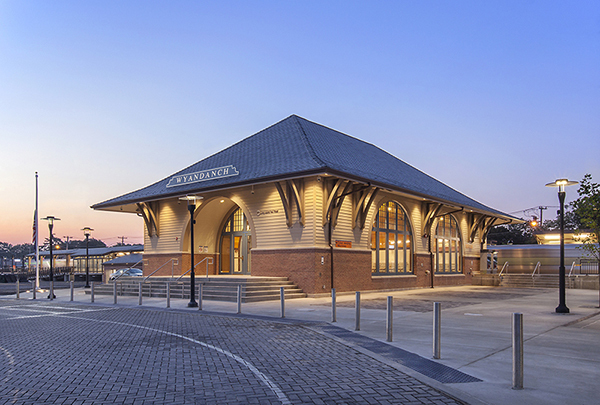 The station’s functional requirements and design input came both from the LIRR and the Town of Babylon, the latter of which was the client during the design period and then retained an advisory role, as the LIRR took over during construction. “Overall, it was an extraordinary collaborative process,” said Peter Keller, the partner in charge of the Wyandanch Train Station design for Keller Sandgren. 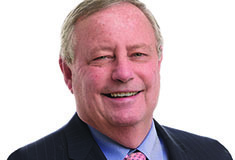 “However, each entity had a clear role and specific requirements that allowed for a cooperative process that enabled us to merge wants and needs into a station design that works for passengers and greatly suits what Wyandanch Rising is trying to achieve,” he said. Familiar with local architectural aesthetic and traditions, Keller Sandgren wanted the new structure to refer back to the great railroad architecture of the late 19th century. Ultimately, they took a page from Henry Hobson Richardson, known as the father of Romanesque Revival. Richardson, most notable for Boston’s Trinity Church, also designed a dozen railroad station buildings that dotted the east coast, and various municipal buildings and libraries, based on his love of classic architecture. Richardsonian Romanesque, as it is also called, also incorporated French, Spanish, and Italian Romanesque features from the 11th and 12 centuries, and, somewhat improbably, touches from everything from Japanese concepts to Syrian arches. 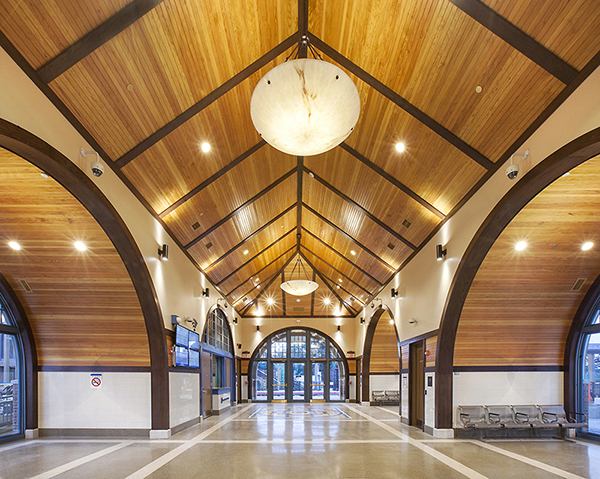 Robert Paxton, Keller Sandgren’s project manager for the new Wyandanch station building, explained that Richardson’s work inspired both the interior and exterior elements. “The exterior materials related to Richardsonian Romanesque in part through the brick, which is on the lower portion of the façade, with PVC clapboard siding above that and faux-slate shingled roofing, all of which also mesh with the local residential style surrounding the downtown area,” he said. For example, there is a Richardsonian overhang roof that reflects the Wyandanch Rising design guidelines. The overhang features supporting framing that’s reminiscent of traditional 19th century train station framing. While this particular framing is made to look like wood, it is actually aluminum. Highly visually appealing, over-height storefronts and windows add to the charm of the exterior. The building features a foundation system of concrete footings and foundation walls that support the building’s floor slab, which is elevated to the level of the train platform. The structural system is comprised of a steel frame and concrete masonry unit (CMU) external and internal walls. Stalco project manager, Ken Coenen, noted that passengers are welcomed inside the station by a striking terrazzo floor. “MTA Arts & Design commissioned the custom artwork, which was incorporated into the terrazzo floor. 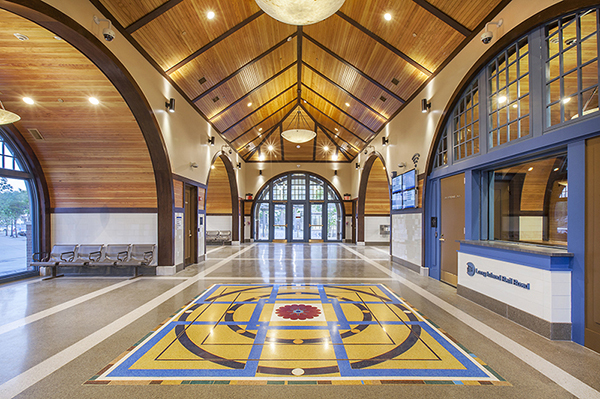 We had the terrazzo contractor replicate the geometric design in bold colors in the center of the station,” he said. Meanwhile, tiled areas on the walls and the ceilings draw the eye with bead board that has a clear finish and dark trim. A large, comfortable lobby/waiting area features metal benches, Wi-Fi, abundant cell phone charging stations, and public restrooms. Stalco also oversaw the creation of a ticket window. “Rounding out the facility are a mechanical room with a complete mechanical system including heating and air-conditioning equipment, an IT room, a communications room, and a fire-protection room,” said Stalco assistant project manager Adele Todisco. The structure is fully fire-protected with sprinklers and fire alarms. The structure’s interiors feature six niches nestled within barrel vaults and accompanied by dramatic arched windows, as well as the above-mentioned central cathedral-style ceiling. There are two seating niches with benches on the west side and one on the east side, the niches on the north and south sides house entrances into the building, an one on the east side serves as a ticket booth. The main lighting fixtures inside the station are inverted, partially globe-shaped pendants, with the open side facing up, rather than down. In this way, light shines on the barrel and cathedral ceilings, highlighting the dramatic ceilings. Light is then filtered down by gray and gold stained glass, which ultimately provides a warm glow. While the LIRR wanted the station to be aesthetically pleasing, it also insisted that the building be easy to maintain. To this end, some of the interior walls feature oversized, off-white subway-style tiles, metal benches, aluminum framing for the storefront windows and entrance, and the terrazzo flooring, as well as decorative oak trim. In addition, the LIRR had many functional requirements that the architects had to accommodate, with The Agency providing statistics for size, based on the number of passengers the station must serve comfortably. In addition, the exterior organization of the station had to work with the large open public plaza that it faces, along with a pick-up and drop-off loop located between the station and the plaza. Sculptures and a fountain in the plaza, by the main entrance on the north side, make the station highly visible and inviting. Meanwhile, two lampposts in front echo those across the street from the station; they are both traditional-looking poles but are equipped with LED lighting elements. As the Double Track construction was taking place simultaneously by different contractors in the area surrounding the Wyandanch Station, this created some logistical challenges. In addition to constructing the second train track, the scope of work included demolishing the old platforms and installing new ones, as well as building a new pedestrian overpass and elevators to connect the north and south sides of the track within the development area. The $431 million Double Track Project, completed last month more than one year ahead of schedule, is part of an unprecedented $6.6 billion investment by Governor Andrew M. Cuomo to modernize the LIRR and bring improved service with a customer-focus in mind. The Double Track Project is a 21st century solution for crowd reduction, delay prevention and service improvements. This initiative added a second track to a 12.6-mile portion of the LIRR’s Ronkonkoma Branch, and was completed on an expedited schedule thanks to an innovative track-laying technology that lays rail 10 times faster than before. Combined with a productive design-build approach, these methods helped to meet the accelerated timeline put forth by Governor Cuomo in 2016. Early completion of the project has freed up LIRR resources for other projects in support of LIRR’s expansion and modernization, like Positive Train Control, East Side Access, Main Line Third Track and Ronkonkoma Yard. Prior to Double Track’s installation, there was only one track along most of the route between Farmingdale and Ronkonkoma. This meant that only a limited number of trains could operate at any given time. It also meant that if one train became disabled, all trains – from both directions – would have no way around the disabled train, causing extensive delays. Now, with a second track, the railroad has the flexibility to go around obstacles, providing a great benefit in added redundancy for the 48,000 weekday customers that use this branch. In addition, the Double Track is allowing the LIRR to provide more additional reverse-peak service along the Ronkonkoma Branch, and, at the completion of East Side Access and Main Line Third Track, will be able to further expand service. As important, the Double Track project and the Wyandanch Train Station both offer the area economic development and community improvement benefits.